Amazing space. This family size home has surreal views on a one of a kind lot in Anthem. Location, location, location, wash lot on North side and single story home on South side. 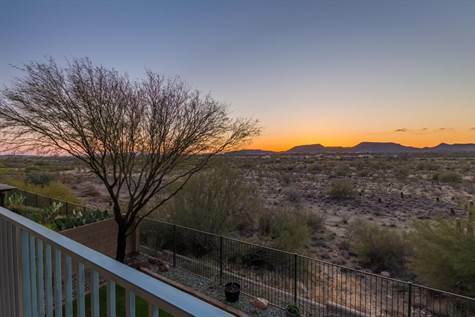 This home features an balcony to view the beautiful Arizona sunsets, extended patio and a loft. All new stainless appliances in the kitchen and upgraded cabinets. Cozy living Room says '' Welcome Home''. Master Bedroom with views features a Fireplace, balcony and a huge walk-in closet. Extra bedroom downstairs. Extended three car garage with epoxy flooring. Backyard is pre-plumbed for gas for BBQ and fire pit. Windows have been upgraded with a special protective 3M film for a cost savings benefit. Cheerful for everyday living with the entire family. Come see! Honor Real Estate buyers agent.